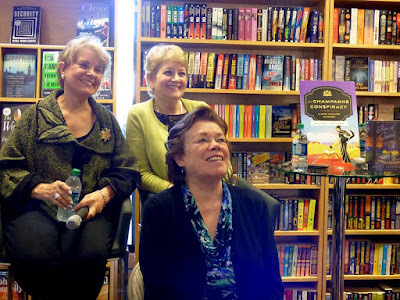 At The Poisoned Pen with Ellen Crosby & Jane Cleland! Saturday, December 10, was a busy day at my favorite bookstore, The Poisoned Pen. When I arrived and stood at the counter to pick up the books I'd ordered, I could see that author Jane Cleland's writer's workshop was in full swing in the back. All the workshop participants were so engrossed in what Cleland had to teach that getting the chairs set up for the author event turned out to be rather interesting. As I was helping get chairs into position, I was wondering how the renovations were going because bookstore owner and event host Barbara Peters had told us weeks before that a portion of the new space was going to be used for these workshops. Barbara was standing right next to me, and she must've read my mind because she told me that the new space was filled with books. 95% of The Poisoned Pen's business is done by mail order, and this is the time of year when they're swamped. I filed that tidbit of information away while I finished with the chairs and then was able to chat for a couple of minutes with the second author, Ellen Crosby. Before the event officially started, several people wanted to record the event for social media posterity, so I took advantage for this group shot. Back L to R: Barbara Peters, Ellen Crosby. Front: Jane Cleland. 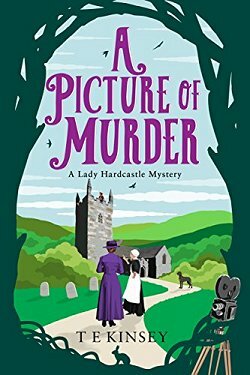 Ellen Crosby has come to The Poisoned Pen for each of her Wine Country mysteries which are set in Virginia. 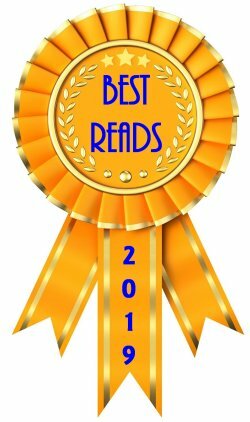 Her newest, The Champagne Conspiracy, is book number seven. 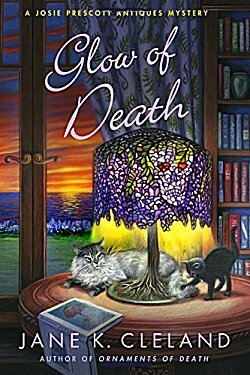 Cleland's newest book, Glow of Death, is the eleventh in her Josie Prescott Antiques series and it exposes her main character to television. When Peters mentioned that one normally doesn't think of Virginia as a place where wine is made, Crosby told us that Thomas Jefferson had tried to grow grapes, bringing vines back from his trips to France, but they were the wrong types of grapes for the Virginia climate. Writing this series with a "French connection" was a conscious decision Crosby made because her husband is French, and she wanted to be able to have at least one of the books set in France. "There are lots of vineyards in Virginia now," Crosby said, "but most of the wine is drunk at the vineyards because their yield is so small. Lots of celebrities seem to want their names on wine bottles, too." What was Cleland's impetus to start writing the Josie Prescott series? "I had written one book, but it didn't sell and it wasn't worth fixing because the market just wasn't there for it," Jane told us. "Someone said, 'Why don't you try writing a cozy?' I'd owned a rare book store for a few years in New Hampshire... and Josie was born." Her setting for the first books in the series was Rocky Point, New Hampshire, which is 300 miles from New York City. She wanted someplace far enough away from Manhattan, but not "too" far in case Josie's work and/or investigations sent her there. Peters then asked about the relative smarts of their main characters. "Lucie Montgomery is not smarter than the police!" Crosby said while Cleland pointed out that "Josie has specialized knowledge, so she is smarter than the police." The author went on to tell us that the hardest part of writing her Josie Prescott books is often finding the pivotal antique. Now Josie is #1 in her time slot on cable with her own version of "Antiques Roadshow," and this brings her in contact with a Tiffany lamp. "Both your characters have strong relationships with men," Peters observed. "Yes," Cleland said. "Josie has a relationship with Ty Alvarez who is a former police chief. I quickly learned that I'd made an error in the early books because readers were seeing Josie as being too dependent on men. I had to work on that." Crosby's Lucie Montgomery has a relationship with her winemaker, Quinn Santori, and we get to learn about his backstory in The Champagne Conspiracy. 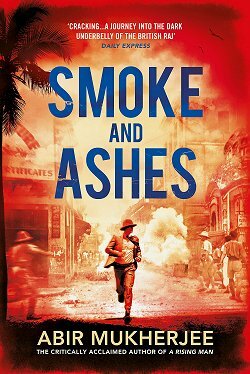 Then Peters wanted to know more about the passage of time in the two authors' books. 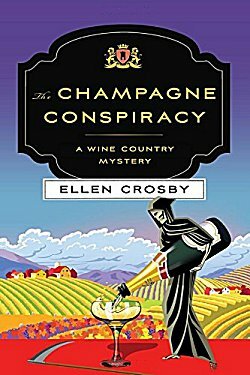 "There's a five-year gap between The Sauvignon Secret and The Champagne Conspiracy," Crosby said, "but in literary time only about six months have passed." "I'm a bit casual with time," Cleland admitted. "Josie doesn't age. Some of the characters around her do, others don't. I happen to think thirty-four is a good age!" Cleland went on to tell us that her next Josie Prescott mystery would be out in 2018, and several people in the audience made disappointed noises and asked her to write faster, please! "I'm a full-time college professor, and I wrote two books in one year-- one non-fiction on how to write and the second one fiction. My husband is a professional musician, and we don't see enough of each other as it is, and there's a third reason why I won't write faster: I don't want to." Everyone laughed and appreciated Cleland's honesty. Both women write outlines before beginning their books. Crosby's previous publisher, Scribner's, "is the New Yorker of fact checkers," and that taught her to outline. 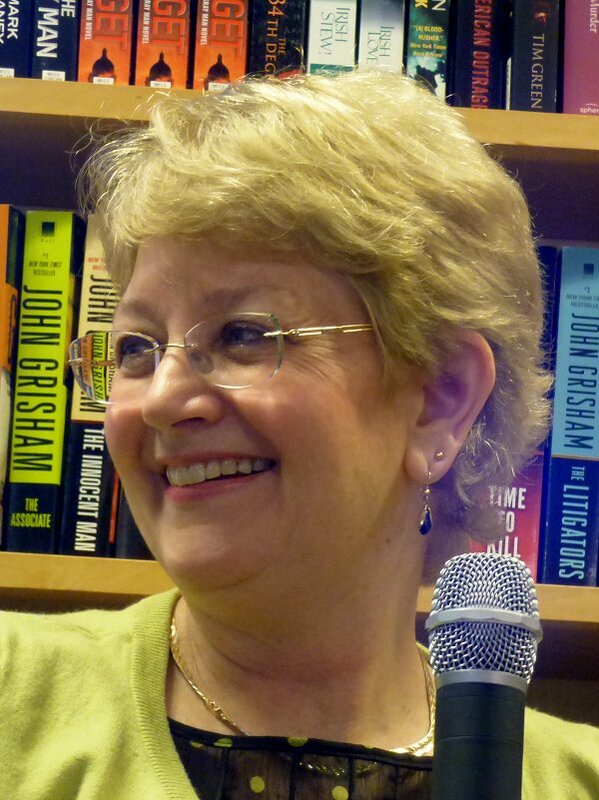 Cleland tends to "write short" and gets notes from her editor to add more detail. One thing that Crosby finds helps her a great deal is to read what she's written aloud. Her critique group does this, too, and they've all found that it helps with cadence, doubled words, and other errors. 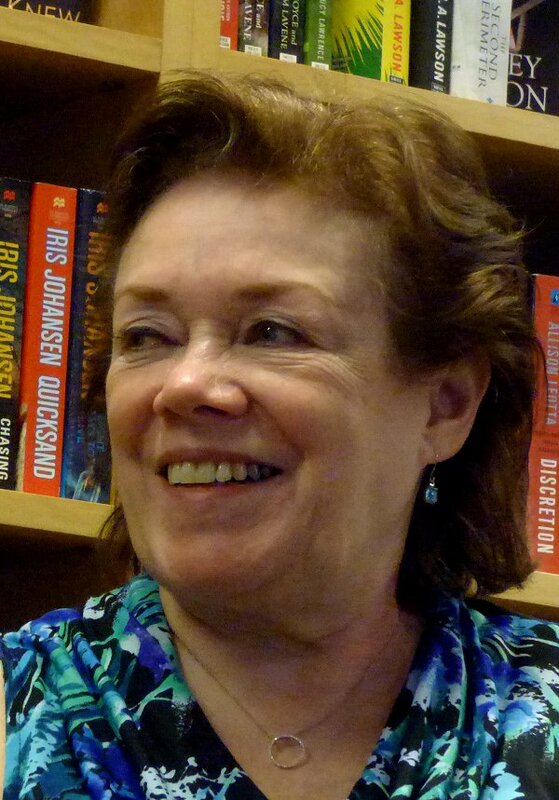 Peters added something from her experience as an editor. "I have an author who uses eight words when one will do. This person will not learn and now just expects me to take care of it. 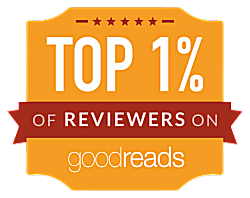 I just finished editing a 92,000-word manuscript down to 78,000 words, and there's more to come. It's exhausting!" Peters added that authors should "never write down to people. Always think you're writing for a roomful of geniuses... which means that you don't have to include every tiny detail." Cleland agreed. "Never get up from your computer or put down your pen until you know the next thing that's going to happen. It's one of the best ways to avoid writer's block." "I solve a lot of writing problems in the shower," Crosby said. Barbara Peters then told us what Lee Child does to solve similar dilemmas, but I think now is a good time to practice circumspection. See? 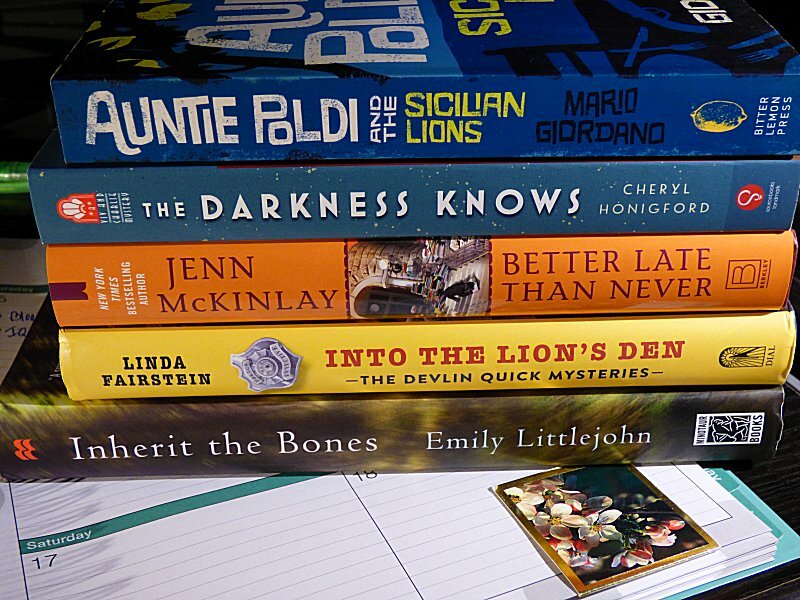 You can miss out on some good stuff by not coming to these author events! 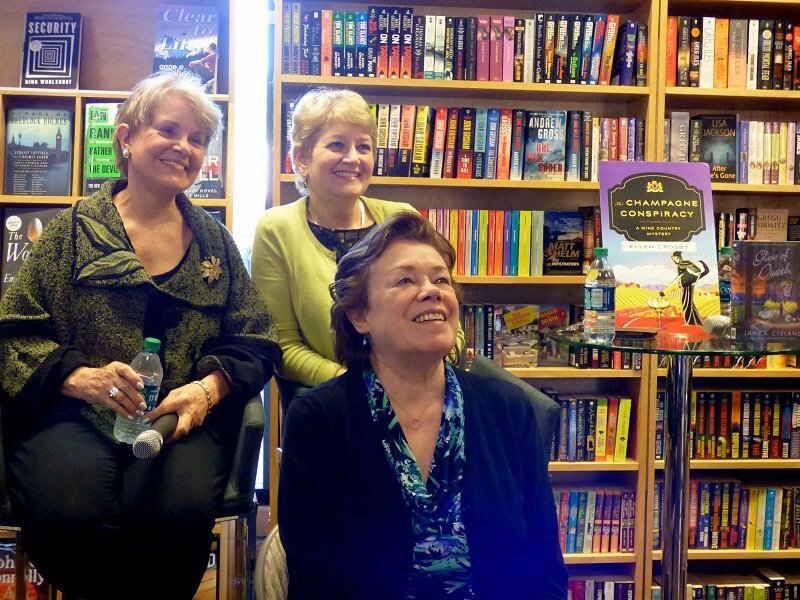 An all-too-short event ended with more about these two authors' next books. The next Josie Prescott book is called Antique Blues and involves a Japanese woodblock print and a 1930 Martin guitar. It will be out in the winter of 2018. The next Wine Country mystery, Vineyard Victims, will be released in November of 2017. Go home empty-handed from The Poisoned Pen? No way! Very glad to hear you had another great visit to the PP, Cathy. 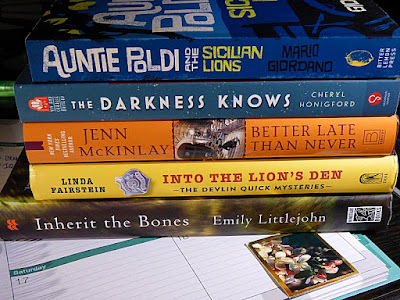 And I have to say, I couldn't imagine going home empty-handed from a visit like that, either! It's a very difficult thing to do! I saw Jane Cleland one time at Lesa's library. She was fun to listen to. And have I read her books yet - no - but she's on my 'must' list for 2017. Thanks for sharing about this. P.S. Had no idea that 95% of the PP business was mail order. Wow! I think that has to be the way for any independent bookstore to thrive. If you don't have an online presence, you're not going to make it unfortunately.